COLEG CAMBRIA LLYSFASI is branching out for a top international logging tournament. The Denbighshire site will host the UK Loggers (UKL) competition and training day this Saturday. Dozens of participants are expected to contest the event at Llysfasi, near Ruthin, though only loggers with chainsaw maintenance, crosscutting and felling qualifications can take part. 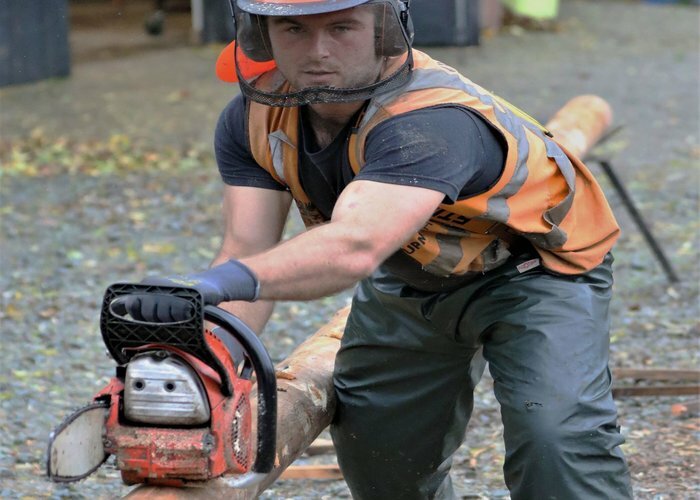 Held in partnership with Tilhill Forestry, Euroforest Ltd, Husqvarna, Aspen and MWMAC, the competition will give new contenders an understanding of the organisation’s precision chainsaw circuit series, which takes place across the UK and Europe. There will also be demonstrations and coaching sessions from previous and current world champions. UKL spokesman Richard Siddons said: “Precision competition logging provides a safe competitive environment that allows chain saw users to develop their skills to a high degree of accuracy. He added: “The event at Coleg Cambria Llysfasi is one of a series based on college locations that train forestry and arboriculture. Richard said there is also a class for participants under 24 years of age, so it’s not just experienced loggers who will make the team. Iain Clarke, Head of Coleg Cambria Llysfasi, said it would be a huge honour for the site to give future logging champions the opportunity to pit their skills against the best out there. “I’m sure it will be a very competitive and interesting event, with loggers from across the UK coming here to North Wales to take part,” said Mr Clarke. Entry to the Loggers UK competition is £5. Free for students. Competitors must be aged 16 and over. Email ukloggers@outlook.com for further information.